Supply Chain Education-University faculty members describe the materials that make up the ideal supply chain education. 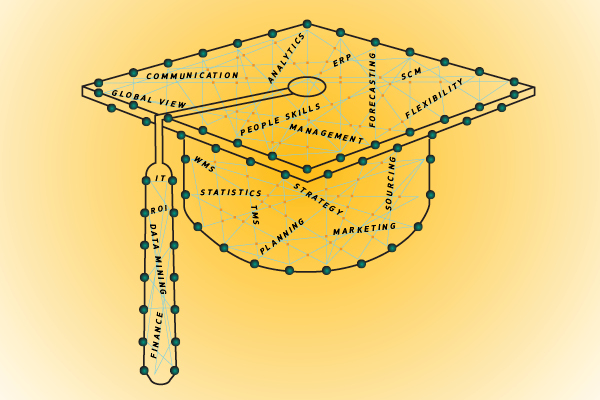 People who want to launch careers in supply chain management can choose from a rich array of academic programs at all levels of study; just look at the Education Resource Guide (page 46). But what exactly should schools cover to ensure students gain the knowledge and skill it takes to manage today’s supply chain challenges? The perfect supply chain curriculum operates in three dimensions, says Nicholas Petruzzi, professor of supply chain management and chair of the Department of Supply Chain and Information Systems at Penn State University’s Smeal College of Business. It helps students 1) master a body of knowledge, 2) develop both hard and soft skills, and 3) learn to apply those skills. We asked faculty from four supply chain programs to share their thoughts on the ideal supply chain curriculum. Here’s what they told us. In Penn State’s undergraduate supply chain program, mastering knowledge starts with the same foundational courses in business and economics that all students take at Smeal. Then, of course, supply chain majors take courses specific to that field. Students spend two years in courses that focus on areas such as new product development, sourcing, manufacturing strategy, inventory planning, and all the other functions attached to the product life cycle. Like their counterparts at Penn State, supply chain majors in the undergraduate or full-time MBA program at Michigan State University (MSU) take both core business courses and courses focused on supply chain management. The supply chain curriculum starts with a broad introductory class, followed by drill-down courses in logistics, operations management, and procurement, plus electives in topics such as project management, negotiation, and transportation. MSU’s core business curriculum also emphasizes information technology, teaching students to use Microsoft Excel, Access, and the programming language Python. “This training makes sure students get the tools they need, along with statistics and quantitative research, to learn how to use data to make better decisions,” says Judith Whipple, professor of supply chain management at MSU’s Eli Broad College of Business. The post Supply Chain Education: Building the Skill Set That Lands Job appeared first on erpinnews.